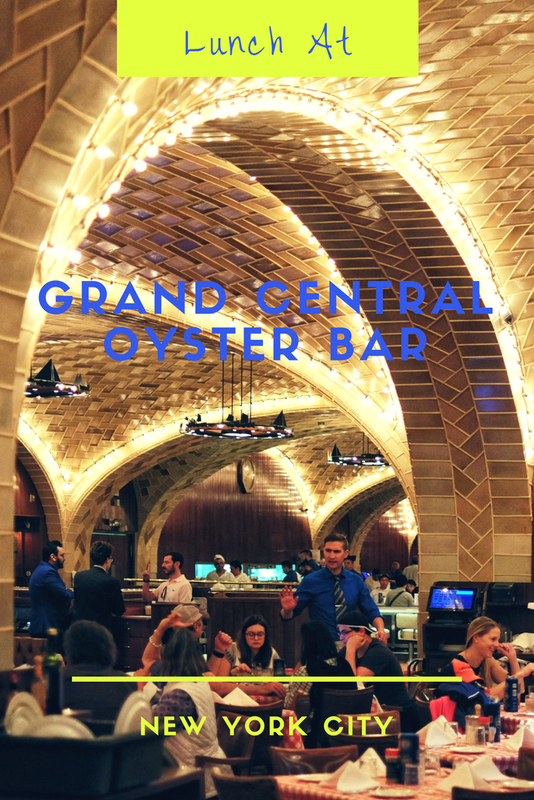 Dining at the Grand Central Oyster Bar & Restaurant was among my must-do list while visiting New York City this second time around. 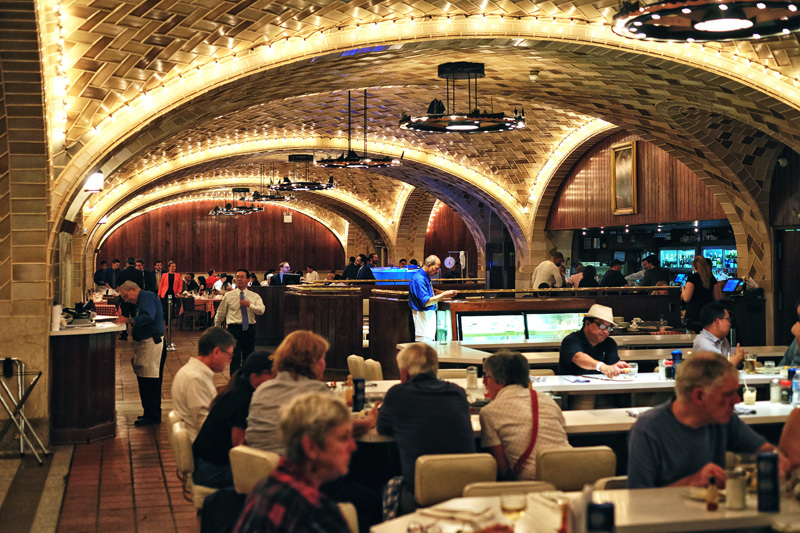 First opened in 1913, over a century ago; having been the old Oyster Bar for almost 60 years, it had had its glory days. 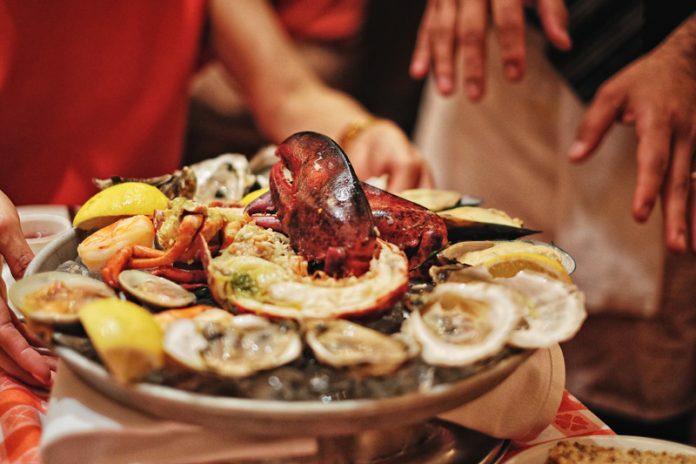 Yes the history of this famous restaurant fascinates me… However, by relying too heavily on its landmark location and becoming known for a lack of excellence, it ‘had no position among New York restaurants’ according to restaurateur Jerome Brody. The business went bankrupt and the location laid dormant for 2 years. 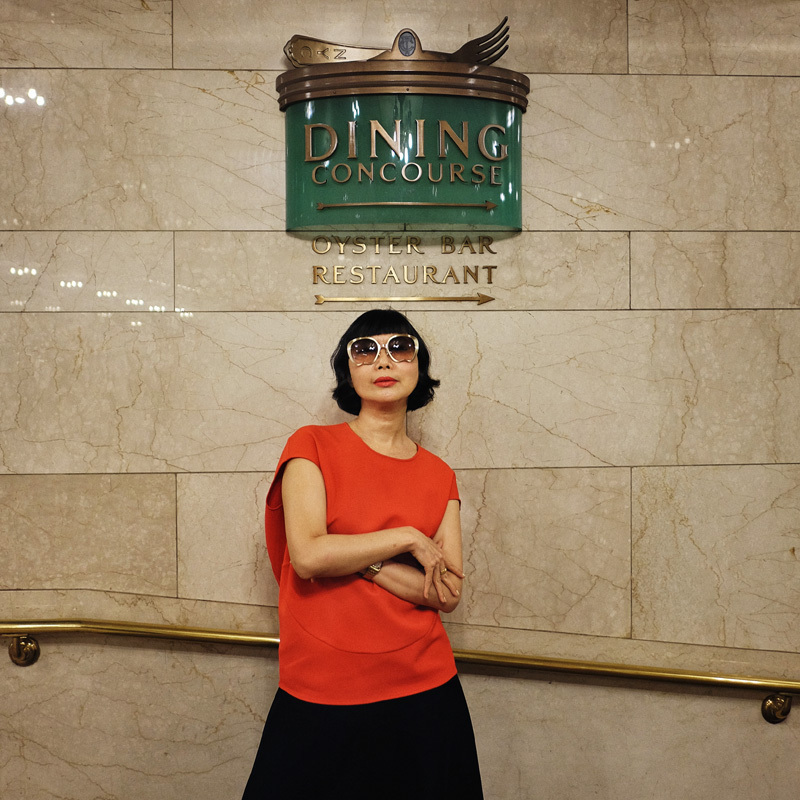 So when Mr Brody was approached by the New York Metropolitan Transit Authority to take over the space in 1974 and breath life back into the old Dame; not only renovation, a complete reinvention was a necessity. Being oyster and seafood lovers as we are; Kent and I needed very little prompting to find ourselves in the Grand Central Terminal and then of course, standing in front this famed eating house’s wide arched front door, eager for a taste of the ocean on only our third day in Manhattan. However irony struck – NEW YORK FASHION WEEK!!! 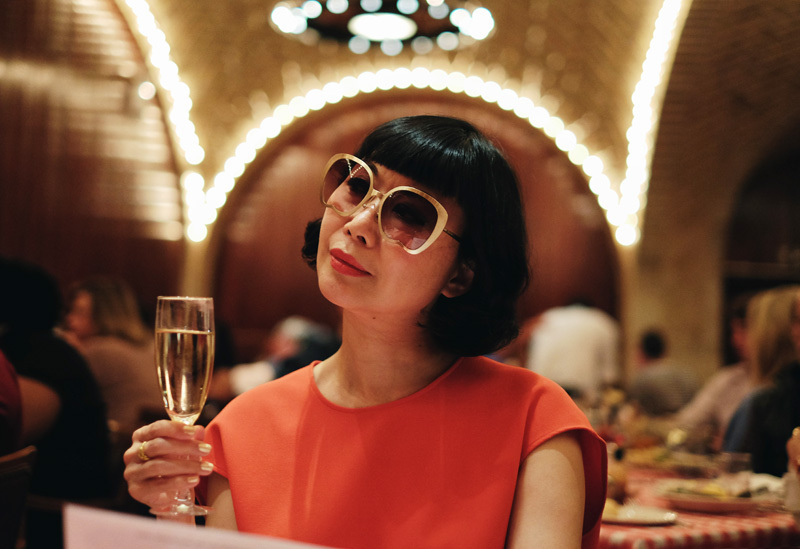 – there was an invitation-only event which had taken over the entire restaurant that day. We learnt our lesson and decided to come back when we had our table booked. 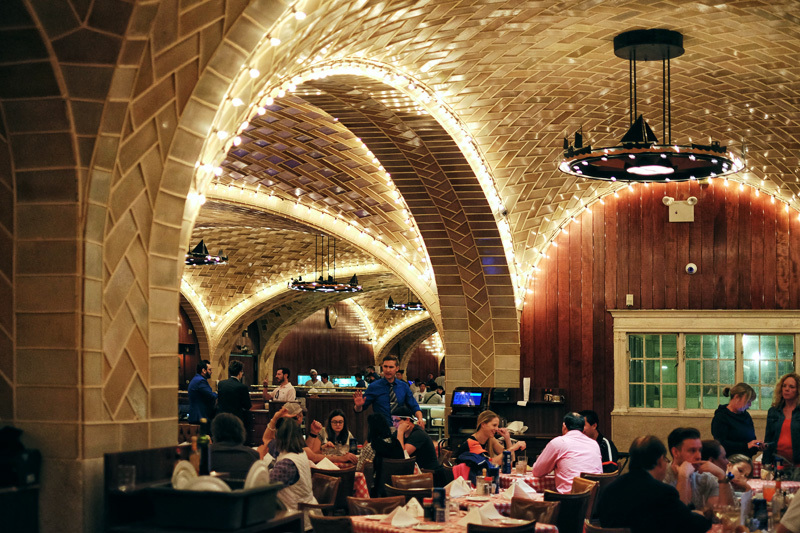 The architecture of this vast transit hub is designed to awe, and even tucked down in the basement level of Grand Central Terminal, the herringbone hatched tiles and vaulted chambers of the restaurant do not disappoint. There are three dining sections: the main restaurant, the casual food bar area with long shared tables – including a long ’50s style ‘lunch counter’ with bar stools facing an open kitchen. 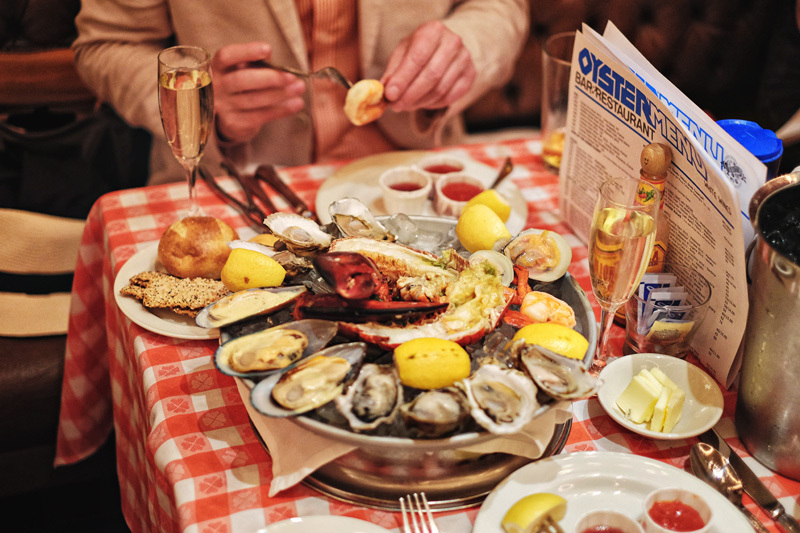 And the Oyster Bar Saloon. Our table was for the formal restaurant which shared the greater open dining space with the food bar. The Saloon is an adjoined room at the opposite end: nautical themed paintings, a bar within; wood panelling, tables with red and white tablecloths – the same kind as the main restaurant. We have booked for the fancy tablecloths and were informed we could sit anywhere as ‘the menus are the same’. Well it’s a special day and highly anticipated so we chose to stay formal and decided to save the food bar side for a later time. I like the newspaper theme menu, although it’s not an unseen style; it suits the ambience especially with ‘Today’s Catch’ which sounds like daily news to me! While Kent enjoyed a cold beer, I took on the difficult task of deciding between a plate of fresh oysters? ‘Today’s Catch’ or simply the ‘Shellfish Platter’? And some chilled white wine, sparkling. ‘You like Prosecco!’ Encouraged Kent, so we ordered a bottle of Prosecco too. 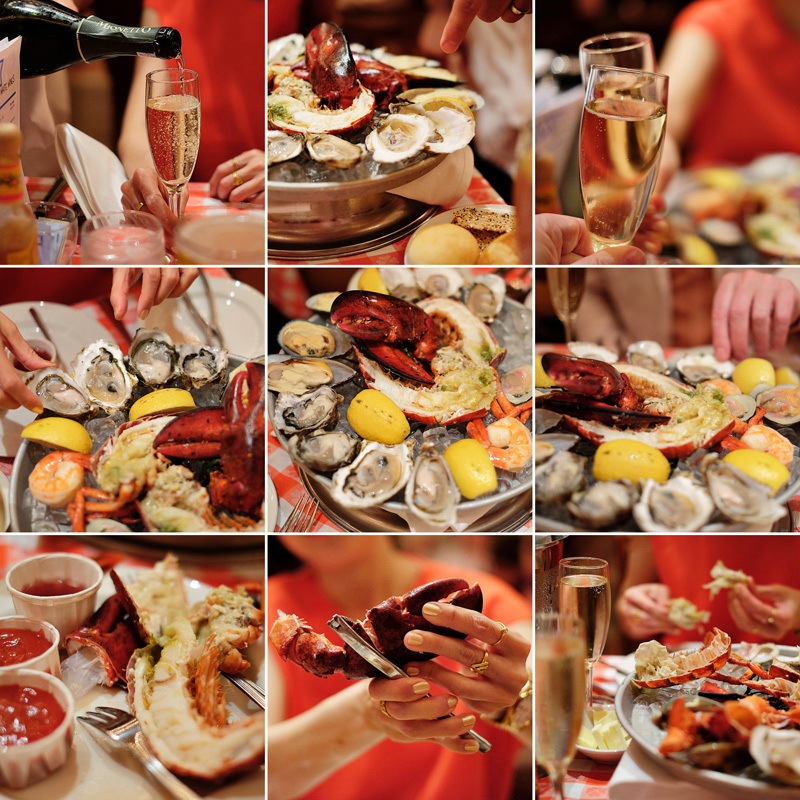 Enjoying our bubbles and fresh seafood at the Grand Central Oyster Bar & Restaurant. 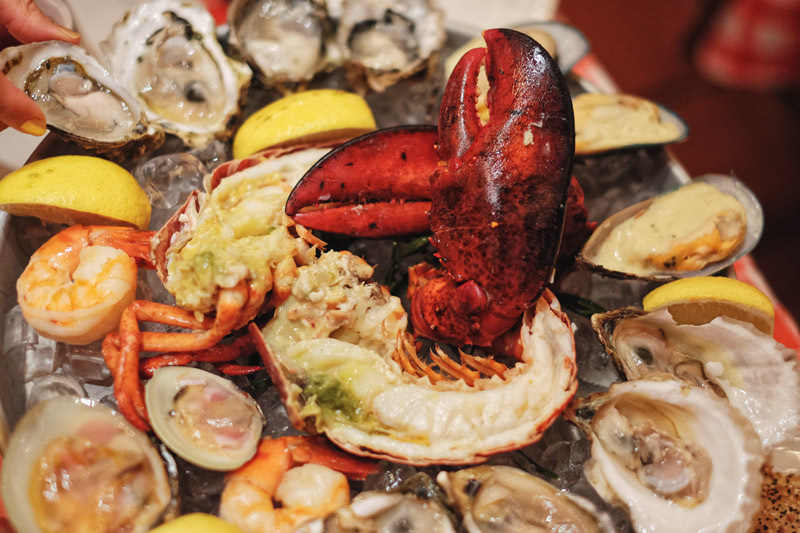 The key to a shellfish platter is freshness and freshness it delivered. What I enjoyed the most were the Atlantic Ocean (East Coast) oysters. They had a refined clean ocean taste and a great balance of salt and sweetness. 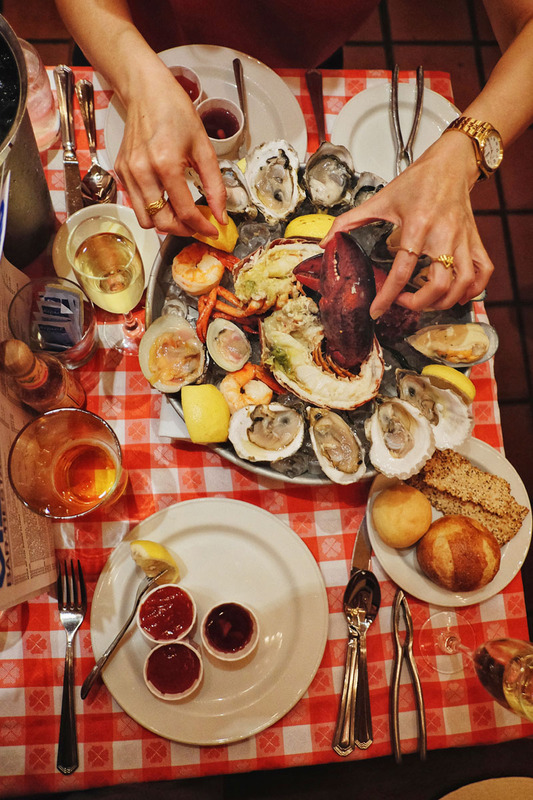 ‘Oh I love the chewy, fuller flesh of the East Coast!’ I shared my thoughts with Kent across the table while he opted for the creamy, smooth bite of the West Coast oysters. So we were happy with our conflict free shellfish platter. Sweet lobster claw and tail ‘so much better than crab’ says Kent. Clams, shrimps (very meaty) and fresh bread; it was a fulfilling meal and perfect with the accompaniment of the chilled Prosecco. 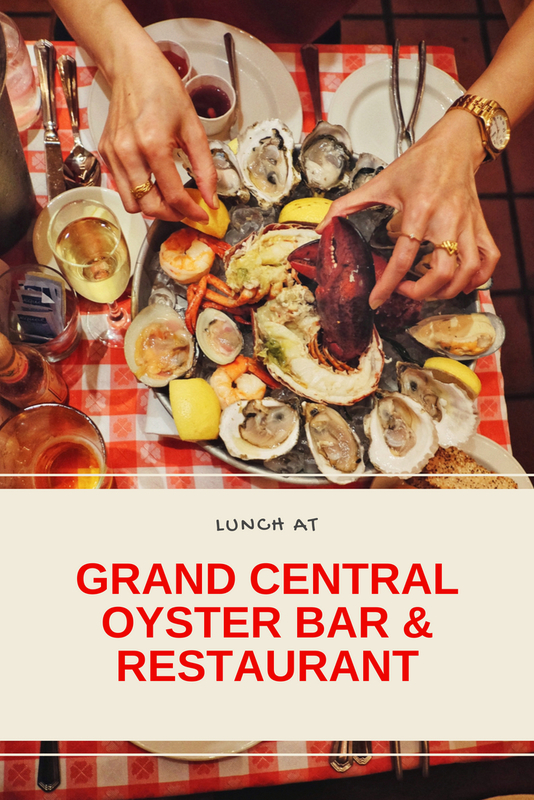 Yes the food is nice, but what makes dining at the Grand Central Oyster Bar & Restaurant so special, is to see, experience; be part of and indulge in the Gatsby grandness of a by gone age. 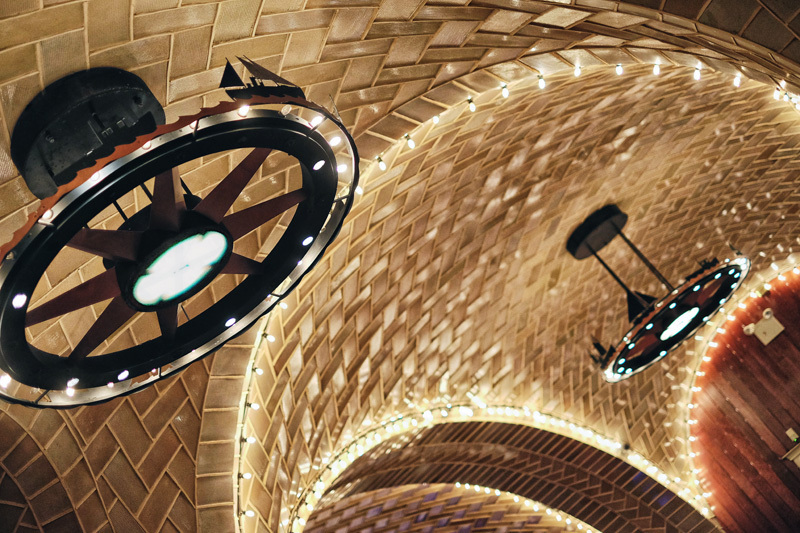 There’s herringbone-pattern Guastavino tiled arches and vaults making this landmark a Beaux-Arts masterpiece you do not want to miss. The renovation and decoration is sensitive to the heritage of the building and history of a seafood restaurant. I love how the festoon lighting highlights the structure of the arches and I adore those iron boat decorations on the ship-wheel-inspired ceiling lights. Yes we were satisfied but we still had room for something sweet. Maybe just the one to share would be enough. 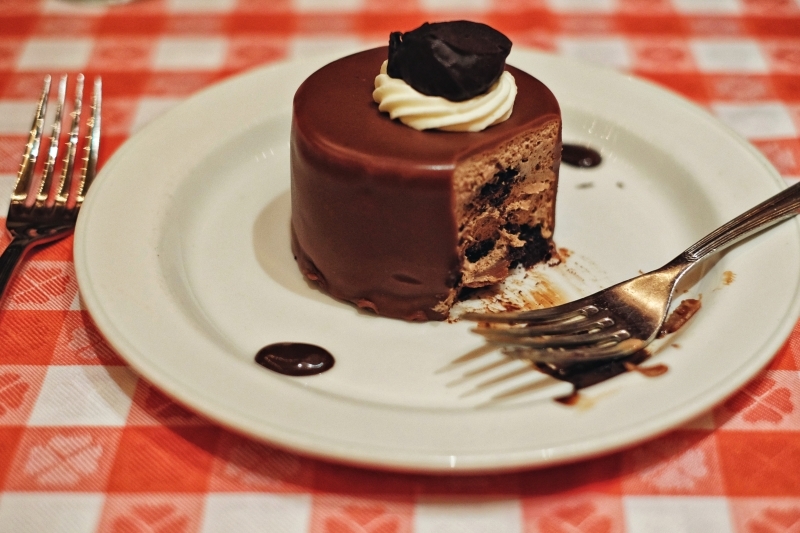 I chose Individual Cinnamon-Praline Chocolate Truffle Cake to share with Kent. And what a wonderful surprise it was! Light, smooth; creamy and yummy! It almost outshone those Atlantic Ocean oysters! Truly a home made cake in its best! A trip to the bathroom which was located at the other end of the hall inside the Saloon, provided ample opportunity to check out the other two dining areas. ‘This is better than what I expected!’ I thought, and why? ‘Down-to-earth meals in historical settings and great energy pumping – I love it!’ Perhaps it’s a travel vibe and Kent loved it too suggesting we should certainly come back and try sitting at the food bar next time. Of course all meals come to an end and with that ending comes the bill. When the bill hit our table it was reasonable, but for non US citizens don’t forget the tipping! Which when dining in New York always pushes the price up 15% to 20% making it a little less reasonable than it seems. While the meal quality was more bistro style than fine dining, overall for us the whole lunch experience we had was lovely. Service was good too. We both enjoyed the atmosphere so much that we promised ourselves to be back for more!